Greetings - to anyone out there who might still be checking in with this woefully neglected blog. Things are changing. 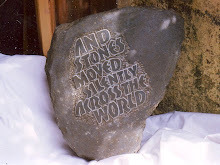 To be more precise, the migrating stones project is changing. I have just heard that the beloved Arts Council has said and almighty YES to funding the next migrating stone. Given that I am in post swine-flu recovery, the strength of my response to this news cannot, and is not, going un-noted. I am, quite simply, delighted. Happy. Excited. Already my mind is buzzing with new ideas and thoughts about how to proceed and I'm in that 'i can't wait' to get on with the research and play involved in developing the project further. So, it's interesting to note what a Yes can achieve: my self esteem seems to have leapt a few inches higher today and the prospect of money has set the synapses firing. Given that I'm a fairly impoverished (financially at least) poet who ventures forth irrespective of pecuniary reward for the most part, I cannot deny the relief involved in knowing that money - lovely money - is going to enable me to eat, pay bills and commission the next stage of the work. Body, mind and soul are more than delighted to receive financial recompense for work about to be performed. At last there is movement. After a long interval, the journey of the migrating stones continues. This time, it is in the form of a programme that will be broadcast on BBC Radio 4 on October 13th at 11 a.m. The programme, Nature: Migrating Stones, is an audio diary that I made when taking stone number three to Australia last year. This curious project evolves slowly, unexpectedly, consistently. I am currently applying for funding for the fourth stone. Greetings and best Equinox wishes to you all. The stones are still rather dormant at the moment, but meanwhile there's an exciting new adventure afoot. I'm going to start teaching again - after a year and a half's break - at the wonderful Home Farm in Welcombe. The short courses are open to anyone interested in writing - we're close to the sea here and the remote landscape is simply stunning.